Rest of Today (Thursday): Periodic downpours lifting northward, with some lingering showers by the evening. Cloudy with temperatures near 60. Overnight Thursday Night: A lingering shower possible. Decreasing clouds. Lows in the 40s. Tomorrow (Friday): Drier with more sunshine than clouds. Highs near 60. Saturday: Beautiful with highs in the mid to upper 60s under mostly sunny skies. It is been raining on and off since Tuesday, many reports are passing 5 inches of rainfall, and we're not quite done yet. The same upper-level low pressure system that has been stalled over the mid-west continues today. The last piece of energy rounding the base of the trough is passing off of Cape Cod tonight. Bands of heavier rain continue through this afternoon and this evening, finally lifting out of most of New England late tonight. Ponding of water on roadways and perhaps some minor urban flooding continues this afternoon as temperature slowly fall through the 60s in Maine, 50s in much of the rest of New England, and 40s western most areas. Wind which was light and variable earlier, is increasing from the west, gusting past 30 miles per hour toward sunset. Additional rainfall of 1 to 2 inches in western and northern areas. Much colder and drier weather works in late tonight, with the exception of Maine where the rain will go on. Overnight low temperatures in the 30s west, 40s east, and 50s in Maine. Wind will continue gusty with colder air for tomorrow. 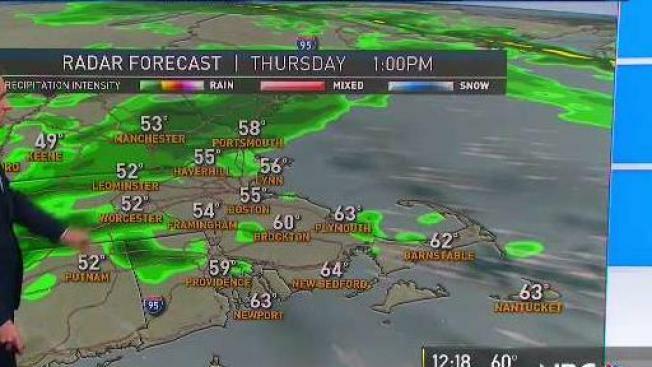 Rain in Maine tomorrow ends from south to north during the morning, otherwise New England has a partly sunny day with high temperature in the 50s to low 60s, and diminishing wind. Saturday looks nice, high-pressure should bring us sunshine and temperature in the 60s. Sunday goes downhill quickly, as a front from Canada will merge with the storm coming out of the tropics, for significant rain and wind later Sunday into early Monday. Low pressure will deepen rapidly as it passes near southern New England just before sunrise on Monday, with heavy rain, and wind gusting past 50 miles per hour. Rain may change to snow and higher elevations before ending. That storm is gone by Monday afternoon, with increasing sunshine and colder air. Temperatures will fall into the 40s by late Monday. Halloween looks nice with sunshine high temperature in the low 50s, probably falling through the 40s into the 30s at trick-or-treat time. Another storm is likely late next week, but we will cross that bridge next week.